The G1 is the most solid and reliable grip for mounting your smartphone camera on a tripod. It is fully adjustable to hold virtually any smartphone model and has been built to last a lifetime. Professionals deserve only the highest quality gear. That's why we've designed the most solid and reliable tripod mount in the market. Go mobile with Shoulderpod and add your smartphone camera to your existing pro equipment. The G1 stands on its own, in landscape or portrait mode, so you can use it as a basic tripod even when you don't have one. Travel light while taking amazing time lapse movies, steady videos or low light shots from your next destination. The Shoulderpod G1 is adjustable to hold devices between 48 to 93 mm wide. Turn the thumbscrew and adjust it from pocket size to full extension in seconds. The adjustable size and V-shaped rubber pads will perfectly hold your iPhone X, 4, 5, 5s, 6, 6+, 6s, 6s+, 7, 7 plus, 8, 8plus Samsung Galaxy, Sony Xperia, Nokia Lumia, Nexus, ... you name it. Please notice that it might not hold extremely thick battery or waterproof cases. 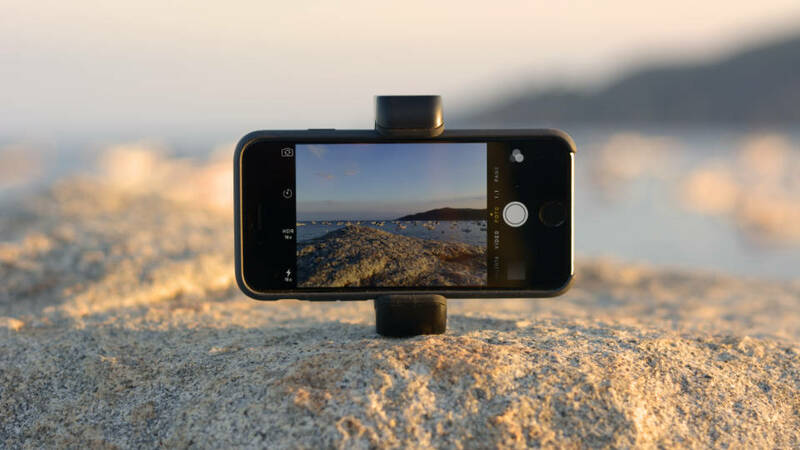 Unlike other smartphone mounts that use only the force of a small spring, the G1 clamps your device tightly and securely thanks to its thumb-screw mechanism and wide rubber pads. Take it from pocket size to full extension in seconds and use it even for action shots under harsh conditions. No matter if you use a professional full size tripod or a small table-top one, the G1 uses the standard 1/4"-20 thread just as any DSLR or compact camera. The G1 holds your smartphone tightly so you can turn it sideways and your device will stay perfectly in place. You are now ready to shoot beautiful portraits, amazing panoramas or vertical live video with your favorite app. At Shoulderpod we've partnered with first class European manufacturers for making a professional and durable product. The G1 is mould-injected in a high resistant polymer and includes machined brass inserts and soft rubber pads. As all our products, it Includes a 2 year guarantee against any manufacturing defects. Add the Shoulderpod G1 grip to your current equipment and discover a new world of possibilities for your mobile photography and filmmaking. No matter if you are a pro or an advanced enthusiast, the G1 will help you deploy the full potential of your mobile camera.